When Paul Walker tragically passed away midway through the production of Furious 7, Universal and director James Wan faced a difficult task. Do they scuttle the film or charge ahead, using rewrites and body doubles to finish Walker’s performance? They ultimately went with the latter option but refused to go into any details. Now, a new report confirms that a digitally recreated Walker appears in the film and that he was brought to life by the same company that made Gollum in The Lord of the Rings and Caesar in Dawn of the Planet of the Apes. The news comes to us via The Hollywood Reporter, who say that Peter Jackson’s WETA Digital was quietly hired to finish the journey of Walker’s Bryan O’Connor. Although WETA declined to comment, it makes sense. If you’re going to hire a special effects company to resurrect a dead actor, you might as well go with the people already known for creating photorealistic, lifelike characters. Before you think Universal made a crass decision here, it should be noted that Furious 7 is actually very tasteful on this front. Viewers who pay careful attention will note that the majority of Walker’s unfinished scenes are completed using his brothers Caleb and Cody as doubles. 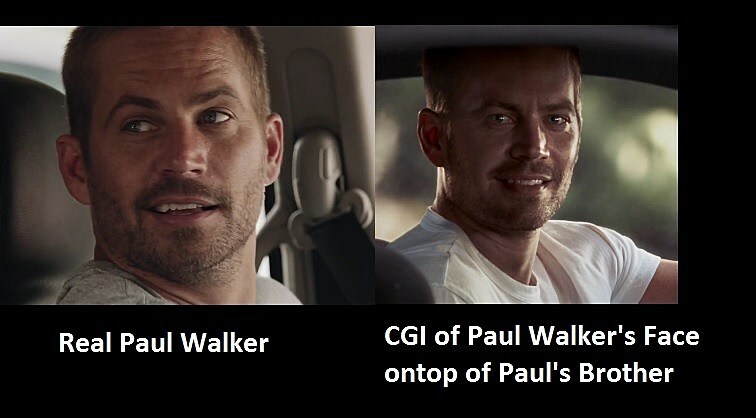 When combined with CGI, carefully chosen camera angles and the right lighting, they are the spitting image of Paul. As tasteful and subtle as WETA’s work is in Furious 7, the article from the Hollywood Reporter can’t help but suggest a darker future where actors are scanned and their likenesses used for years to come (which just so happens to be the subject of the excellent sci-fi film The Congress). They note how actors are already digitally recreated for impossible action scenes, but some performers are apparently being scanned for “archival” reasons. In theory, this means Chris Evans could keep on playing Captain America for the next century. In theory, that is also when we stop watching movies. Furious 7 opens in theaters on April 3.